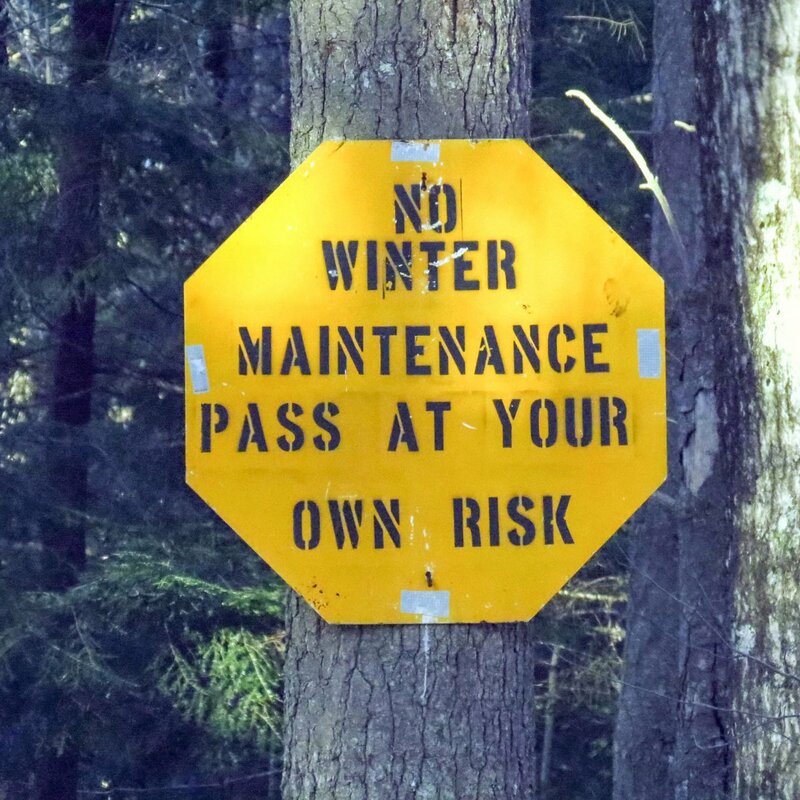 In New Hampshire a class six designation means a road isn’t maintained by either the state or the town, so it could be rough going. 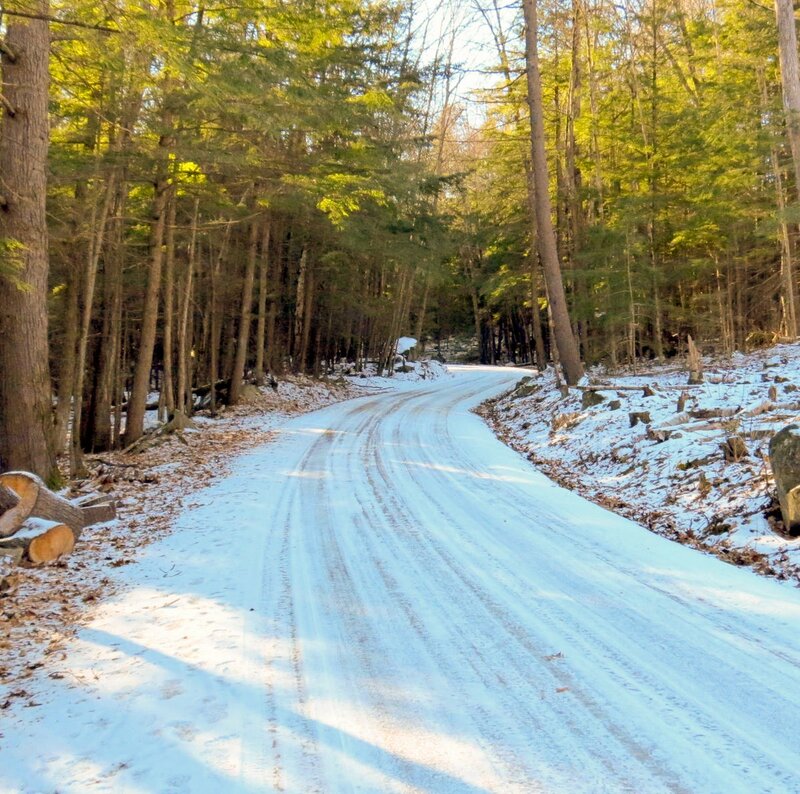 I don’t know if this road actually has that designation but I do know that it can be impassable in winter, so whether or not you will make it over its entire length is anyone’s guess. Since we have had very little snow this winter I doubted there would be much snow on it and I was right. There was a dusting but nothing that needed plowing. 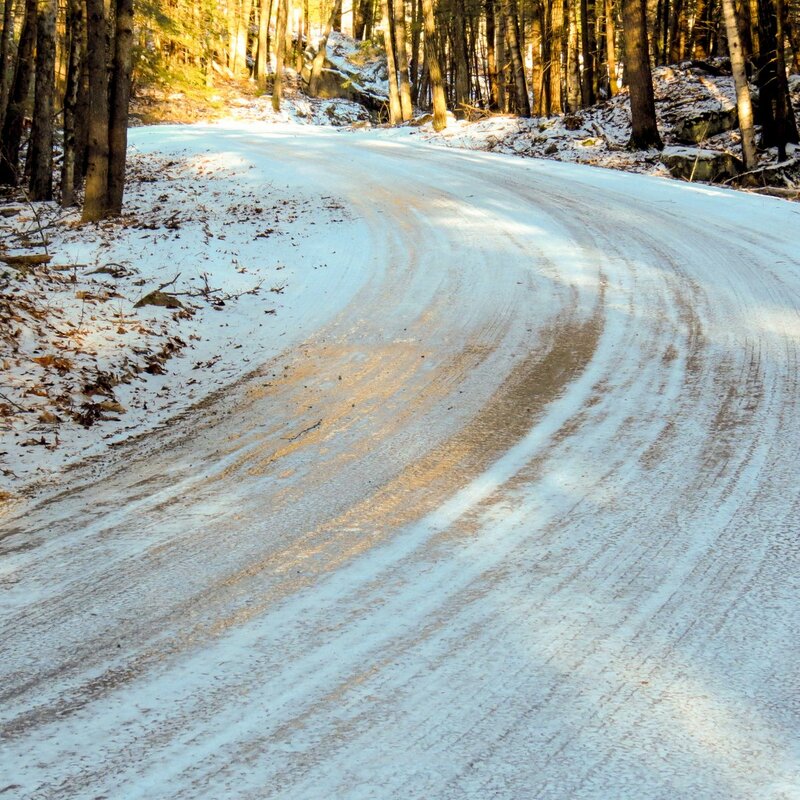 If anything would give a driver trouble on this day it was ice; the road was like a skating rink so I walked on the edges, which is where I would have walked anyway. It’s hard to see anything interesting from the middle of a road. The road was also heavily rutted. 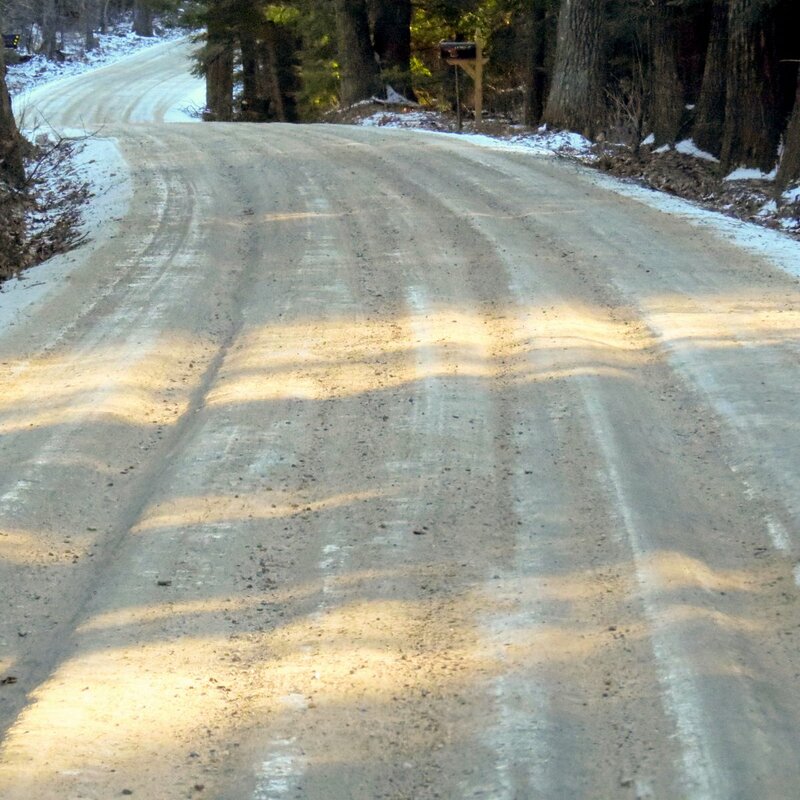 I’ve driven over it in spring and between the ruts and the washboards, sometimes you feel like the teeth will rattle right out of your head. 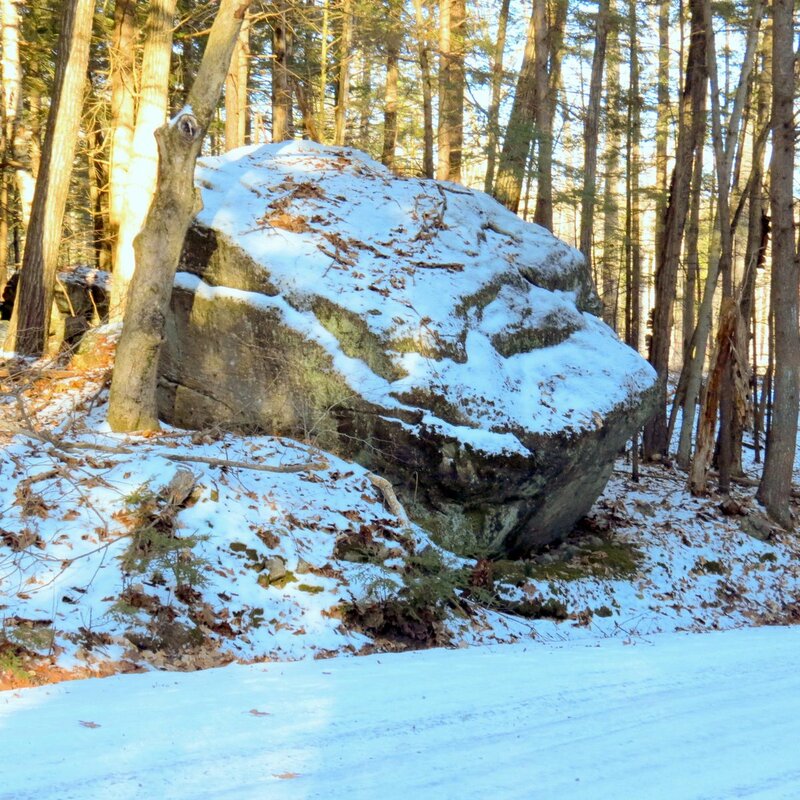 It’s common in this area to see huge boulders right on the very edge of the road. That’s because in the 1700s when many of these roads were laid out stones this big were impossible to move and it was too much work to drill and blast them, so the road was simply built around them. And there they still sit to this day. This one was easily as big as a delivery truck. 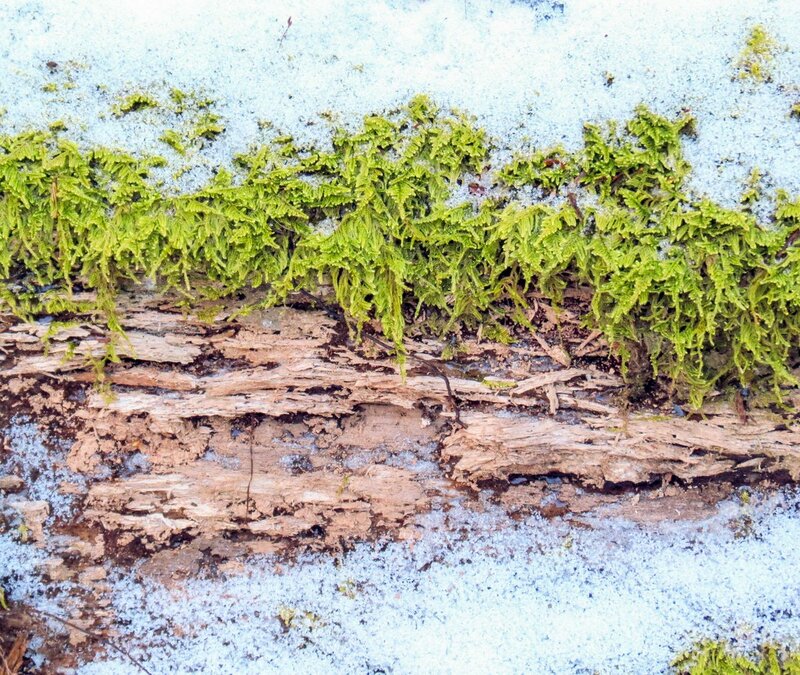 I loved the beautifully bright green brocade moss (Hypnum imponens) that grew on a log. This pretty moss gets its common name from the way it looks like it has been embroidered on whatever it grows on. I’ve searched high and low for it so I could include it in my moss posts, but I never could find any. Now all I need to do is remember where it is. 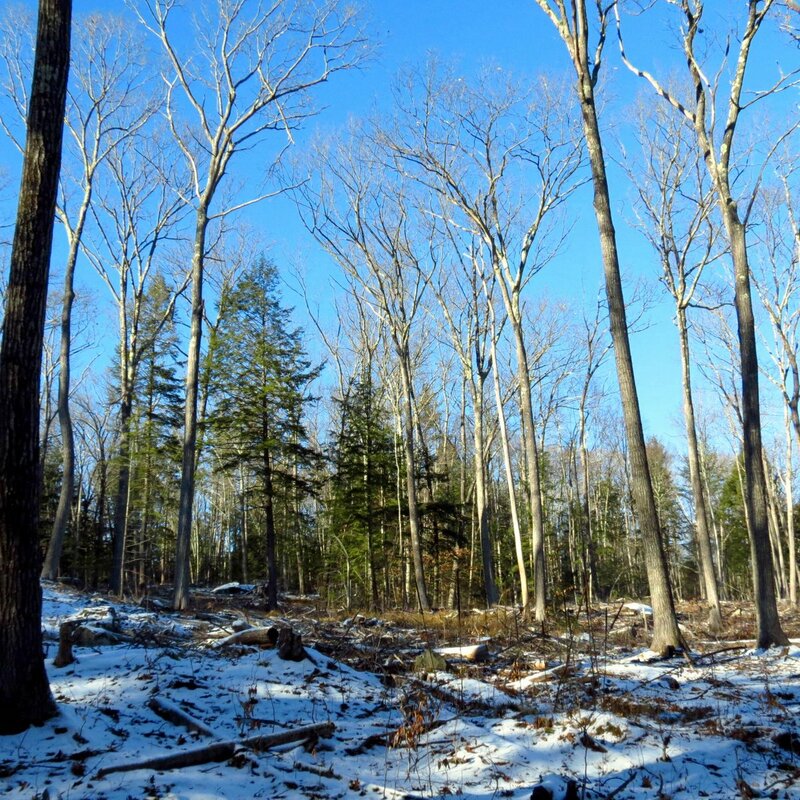 There was a lot of logging going on out here last summer. 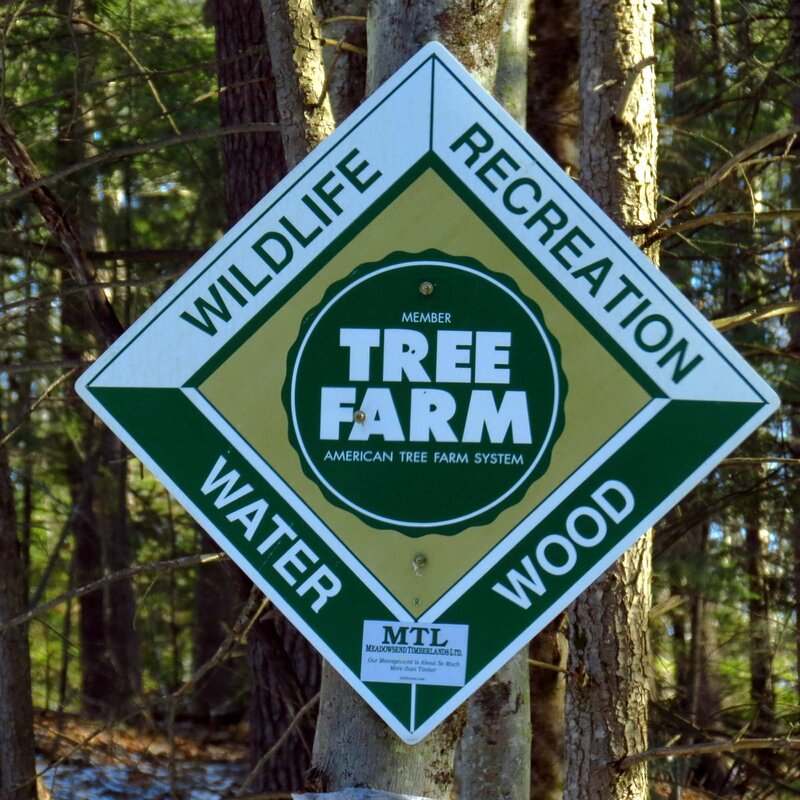 It looks like they left a lot of the deciduous trees and took mostly evergreens, probably hemlock and pine. 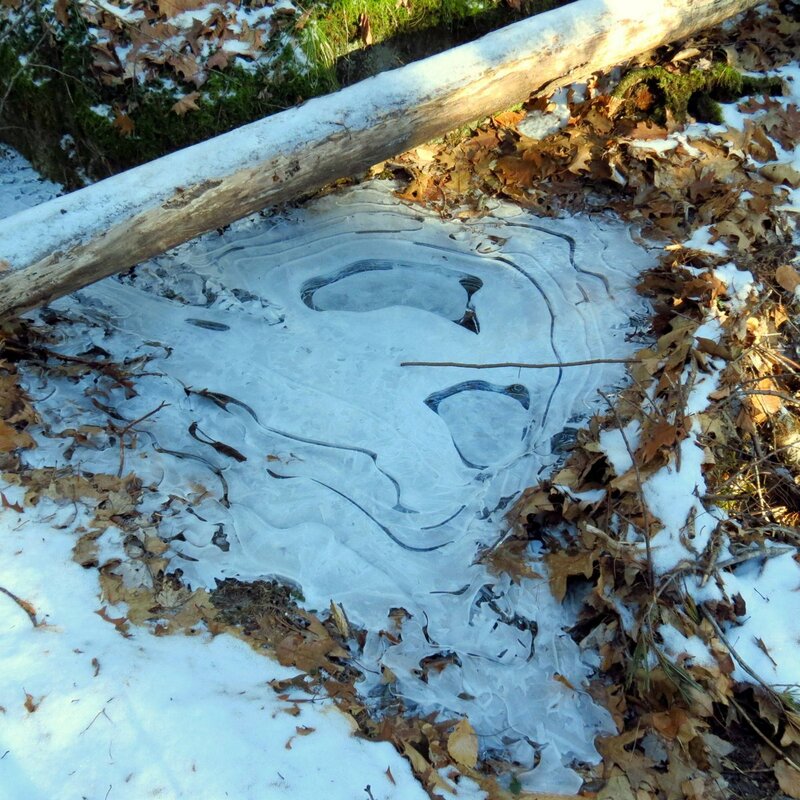 A small stream had formed a pool and it was covered over by what I call puddle ice. It’s that brittle white ice full of oxygen bubbles that makes tinkling sounds when you break it. Seeing it always takes me back to my boyhood when I would ride my bike through puddles covered by it in spring. I’ve thought of it as a sign of spring ever since, even though I see it in fall and winter too. 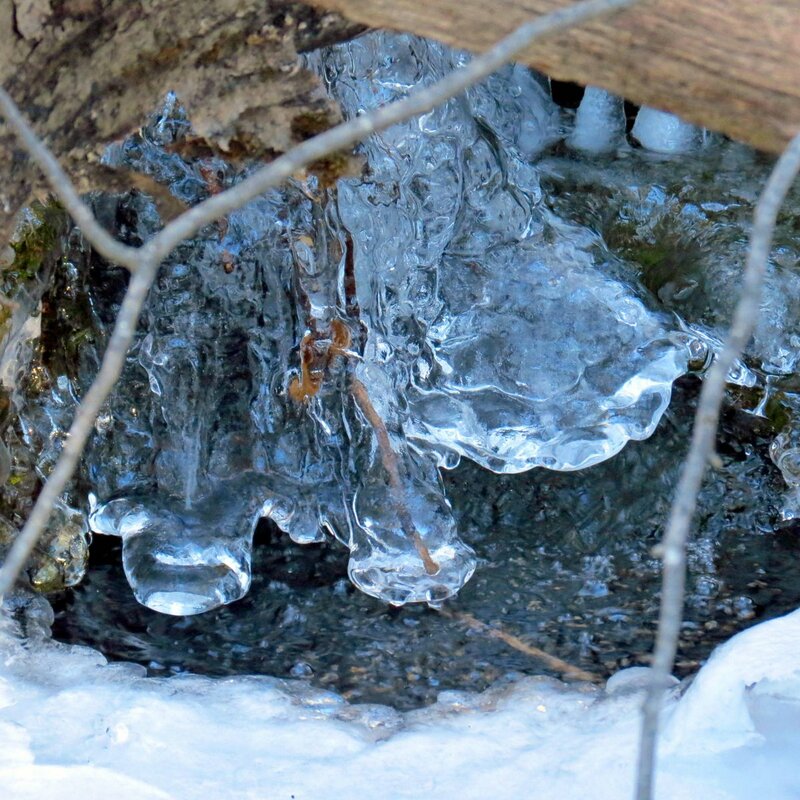 The little stream also had some beautiful ice formations in it as well. 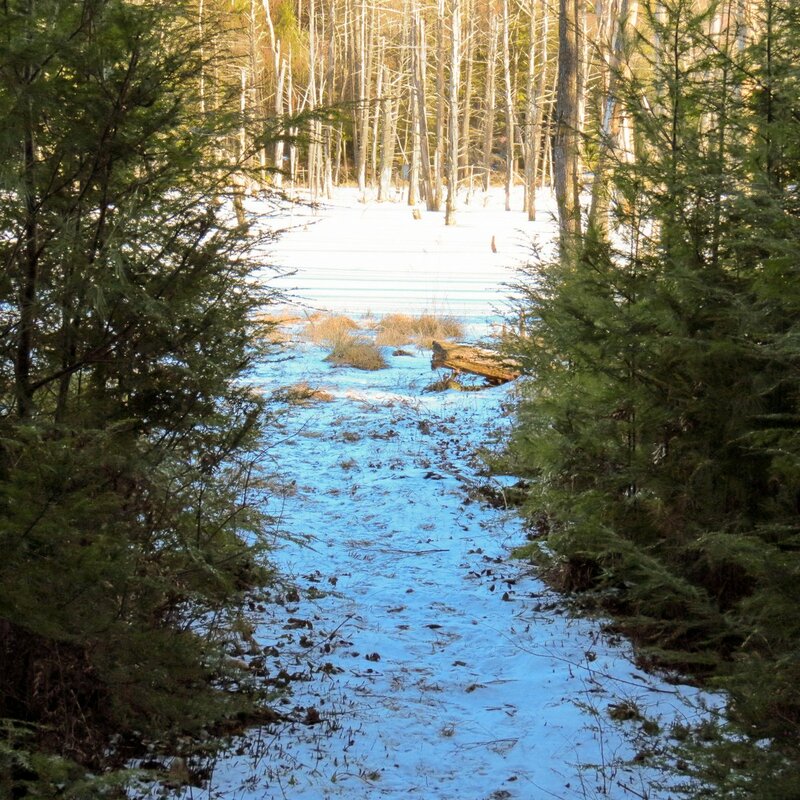 If you know where to look you can find a winding trail through the woods that leads to a beaver pond. 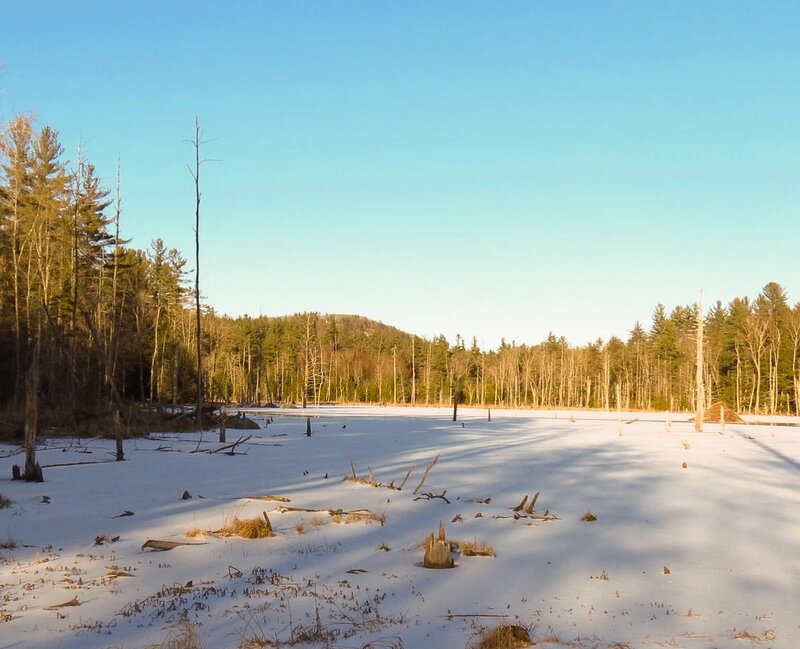 It’s a large pond, several acres in size. 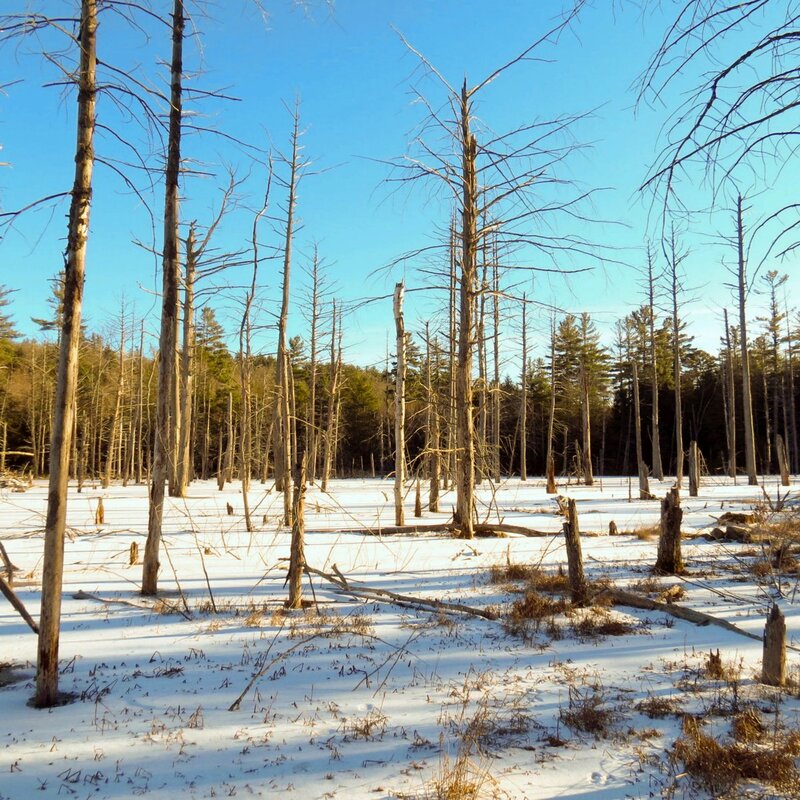 This shows what happens when a forest is flooded by beavers; what trees they don’t cut down drown and die. Areas like this often become rookeries for great blue herons because they’re full of frogs and small fish. I’ve seen herons here before but I haven’t seen a nest yet. 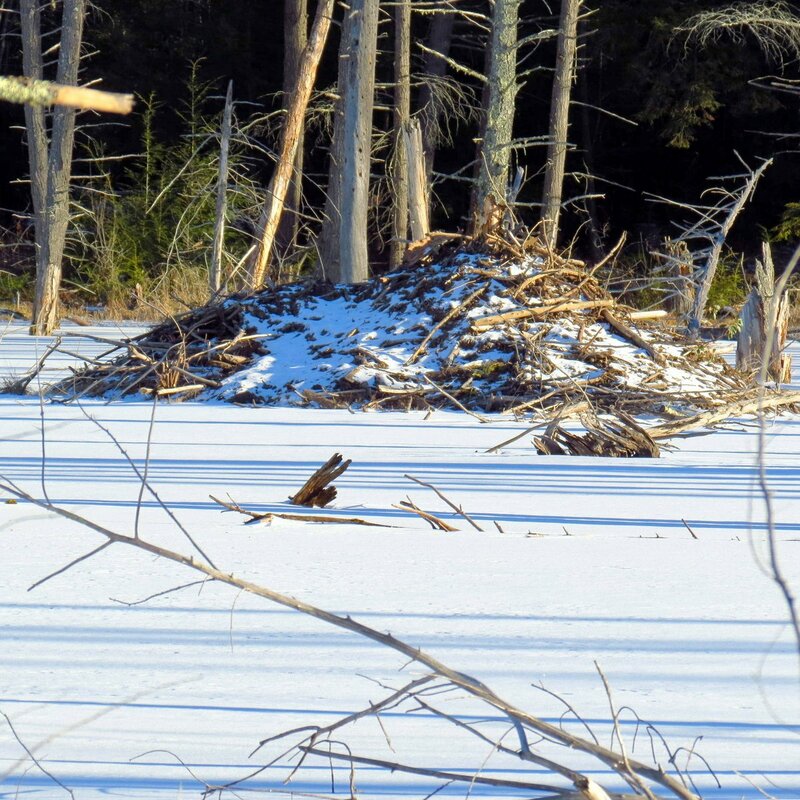 There are several beaver lodges here and the open water near this one suggests beaver activity. They work hard to keep channels open in winter. This lodge doesn’t look like most I’ve seen. It looks as if it has had a lot of mud added to the outside, which is something I haven’t seen. 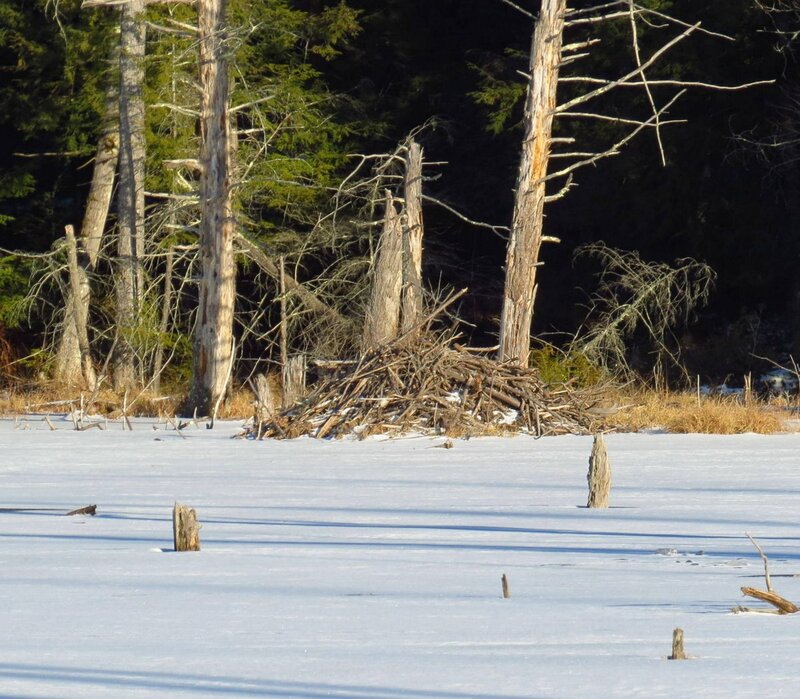 This is more what I think of when I imagine a beaver lodge. They usually look like a pile of sticks, but the one in the previous photo looks more like a pile of dirt. I think this one might have been abandoned. It had a light coating of snow on it and from what I’ve seen beaver lodges aren’t snow covered for very long unless we’ve had heavy snows. Heavy snow helps insulate the lodge and sunshine helps warm it. 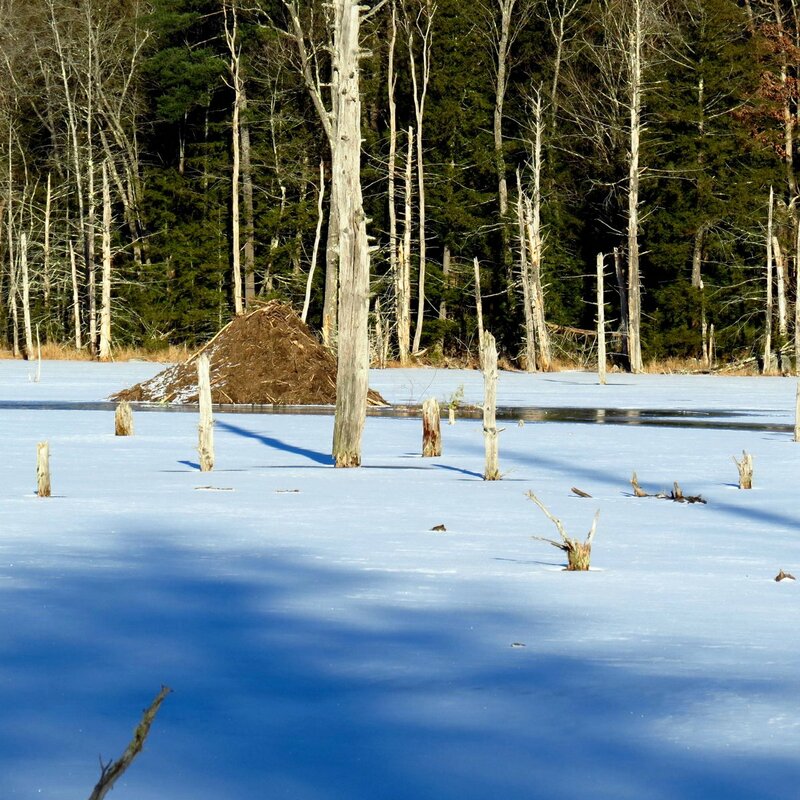 The temperature at water level in a beaver lodge is usually about 32 degrees F. but it might fluctuate a bit due to outside temperature and body heat generated by the beavers themselves. They have to leave the lodge to eat but they lose body heat quickly in the cold water, so they aren’t very active in winter if it is very cold. So far this winter they’ve had it easy but that’s about to change, with wind chills of -14 degrees F. expected on Monday. 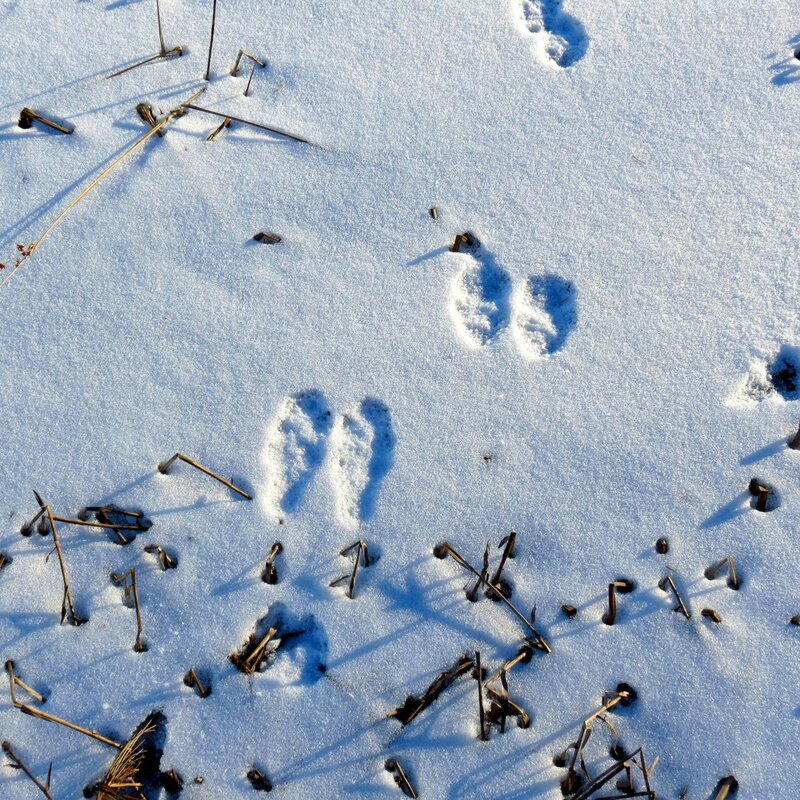 I thought these were rabbit tracks but I think the smaller front feet should be directly in front of the larger rear feet, not off to the side like what is seen here. Maybe it was a turning rabbit. I can’t even guess what made these swishy tracks. 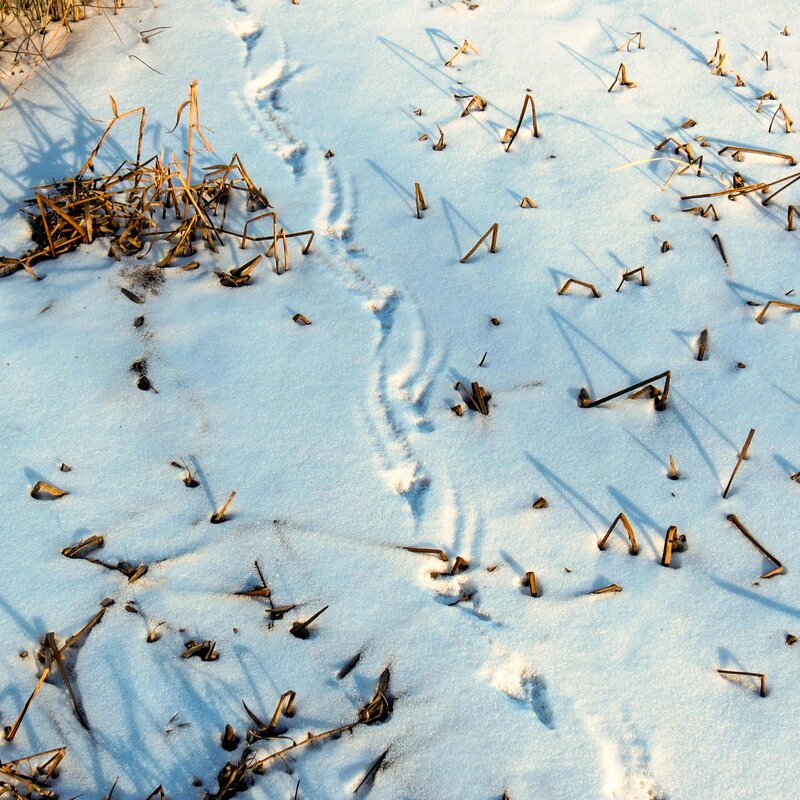 I’ve looked at examples of both animal and bird tracks and nothing comes close to matching. And it’s too cold for reptiles, so I’ve struck out. 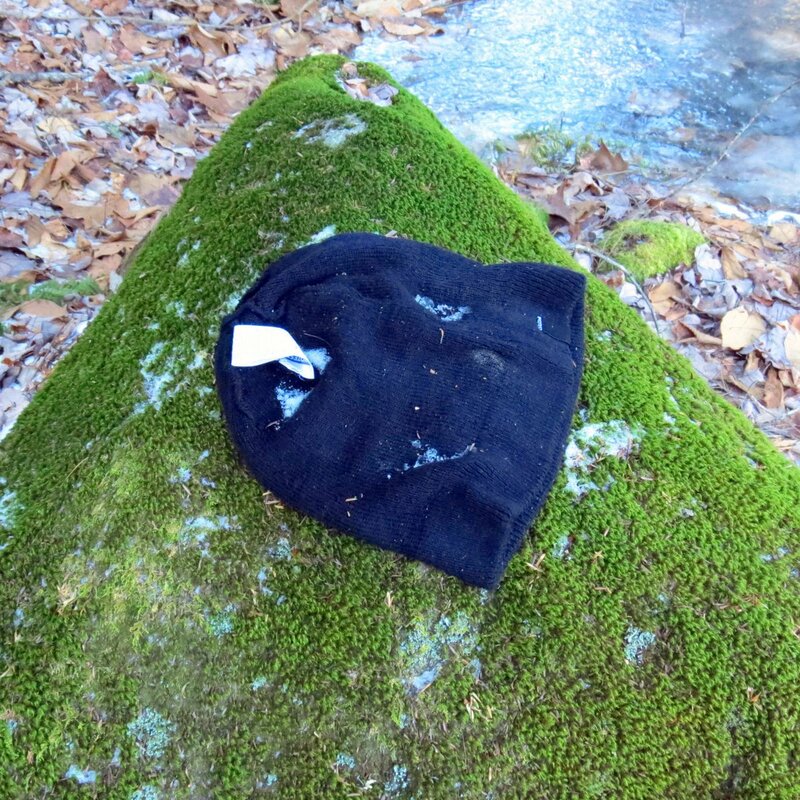 Someone lost their hat and a kind soul picked it up and put it on a mossy rock. You meet very few unkind people in the woods, I’ve found. 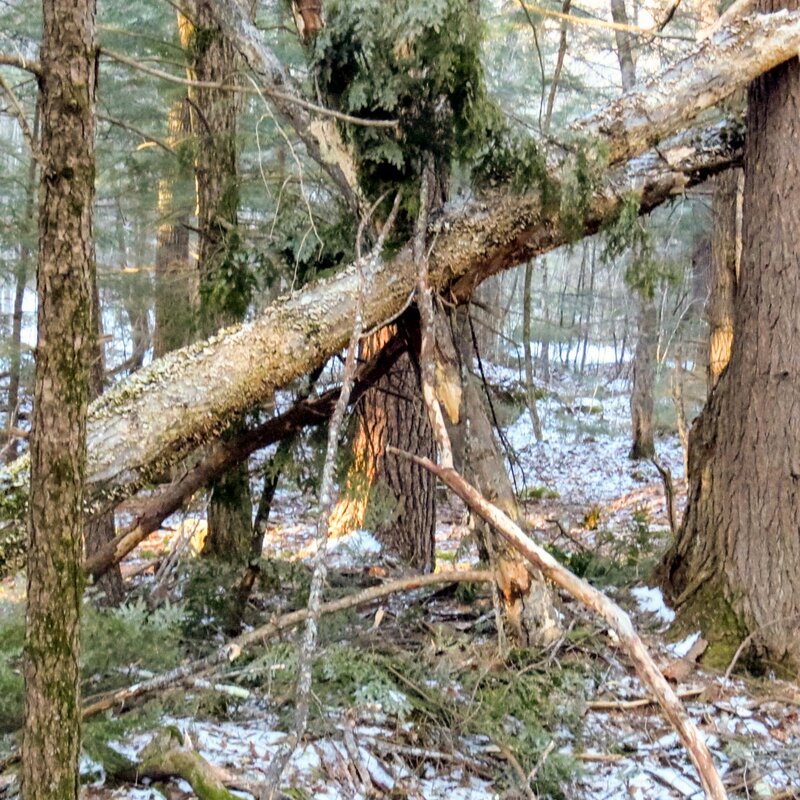 The reminders of the terrible winds we had last summer are all around me each time I go into the woods, in the form of tangled blowdowns like these. In fact I saw several just like it in these woods. I think thousands of trees must have fallen in this area but I also think that the trees that were already weekend by disease were the ones that fell. You can see bracket fungi all over the largest of these and that’s a good sign of a sick tree. I’ve spoken about how water resistant oak leaves are on this blog for years, but now I can show it. Oak leaves can take a year or more to decompose because they are leathery and contain a lot of woody substances like lignin and cellulose, and I’ve always believed that it is also because they don’t absorb water as readily as leaves from other trees. 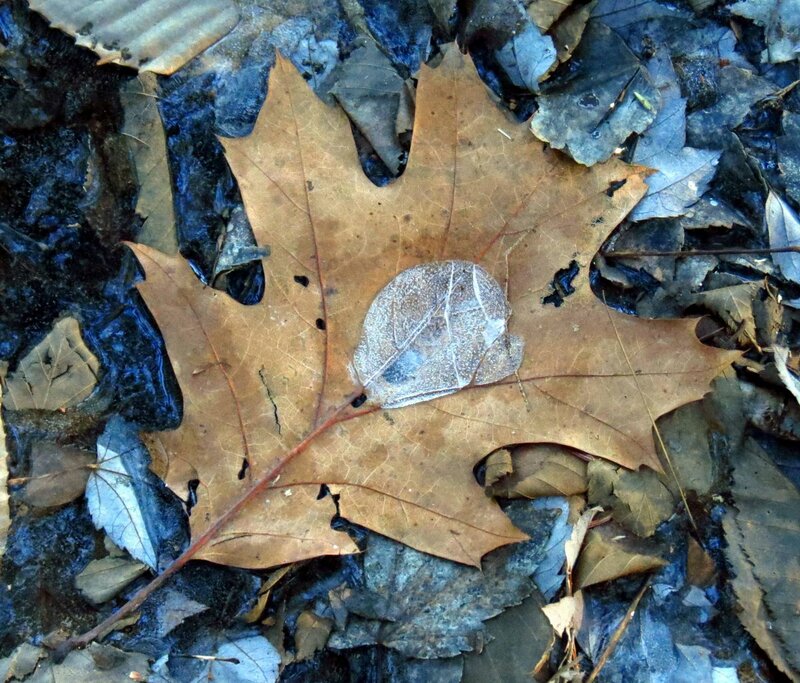 This photo shows how water will puddle on an oak leaf.